Having been a fresher just over three years ago, I can remember the palpable mixture of excitement and nerves, heading around the stalls in your strict groups of 7 people that you now share a flat with, having not known any of them existed the previous week. LMU Freshers fair reminded me of the vast pool of opportunities that are ahead of you in the first few weeks of university. 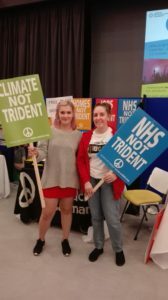 Amongst the numerous stalls in the LMU hall, CND put up our colourful stall and we stood at the ready with tablets, temporary peace tattoos and badges eagerly awaiting the influx of students. As a single-issue campaign organisation, our message is pretty clear. No Nuclear Weapons. 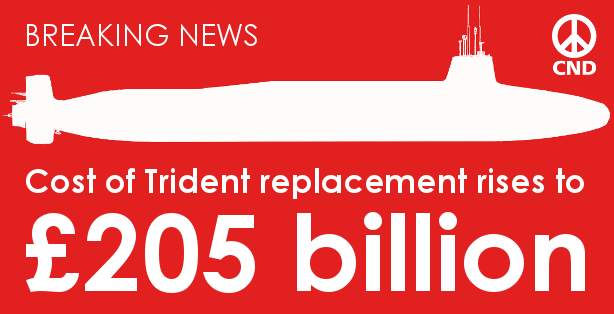 No Trident replacement. No Nuclear Power. 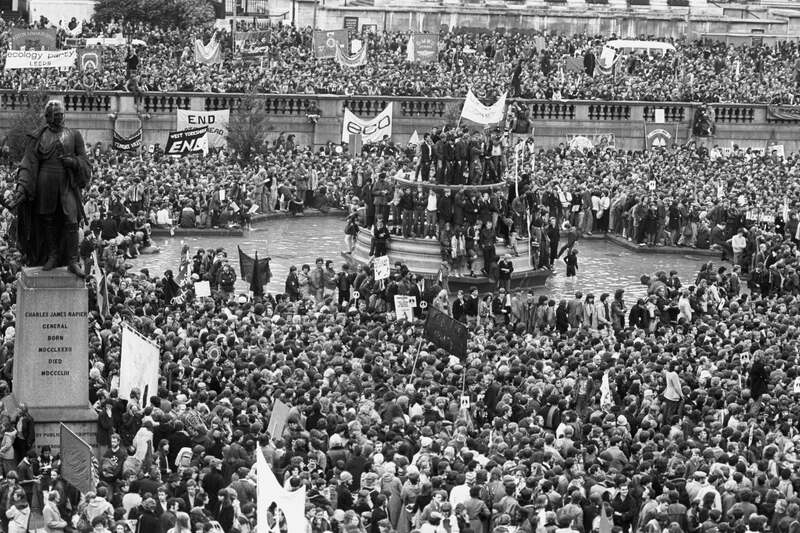 Being politically active doesn’t mean you have to grab your soapbox, stand in Speakers Corner by Hyde Park and scream your heart out. Nor does it mean that you have to watch the Andrew Marr show religiously or read Private Eye every fortnight. If you have strong opinions about government choices and you actively want to be a part of the change, you are political. 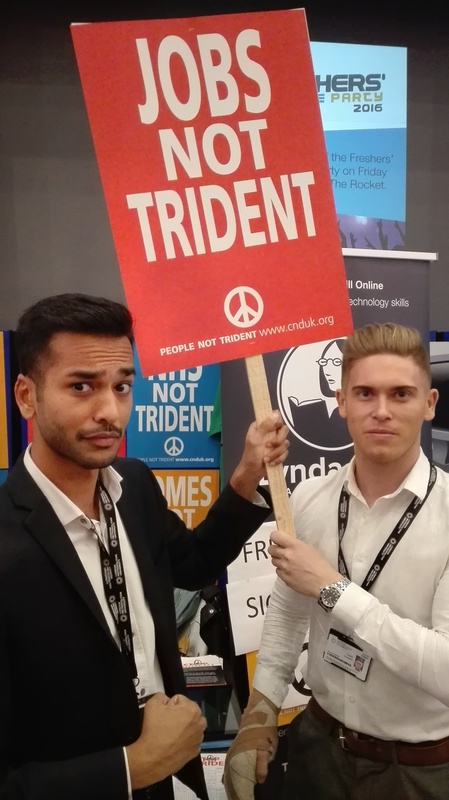 By giving your e-mail to a direct action campaign, like CND, you are taking a small step into a world of grass-roots protest. At LMU alone we managed to collect over 200 signatures. 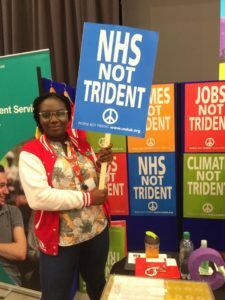 These signatures and e-mail addresses will be sent to the government to show the how thousands of students, all across the UK, are disappointed with the replacement of Trident in the face of increasing cuts to student bursaries and increased student fees. For the past few years, “millennials” have been constantly mocked and accused of not being politically interested or engaged. We are accused of spending all of our time devoted to mindless social media, reality TV shows and spending money solely on booze and nights out. Yet the engagement that we received from such an eclectic mix of students at LMU fly’s in the face of the idea that the youth don’t care. Initially, we were greeted by the Sabbatical Officer and deputy President for LMU Students Union Barbara Ntumy who readily signed up to our petition and wielded herself with a placard (pictured above in the red jacket). 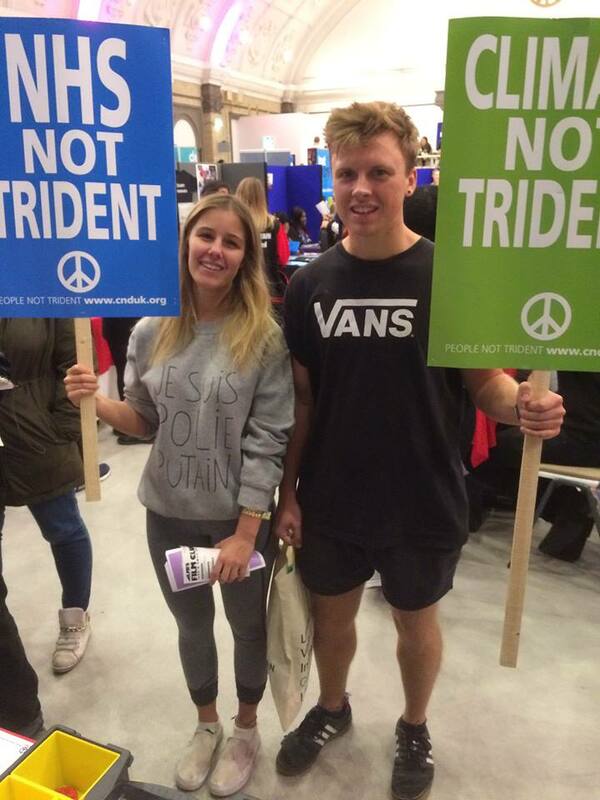 The majority of students we engaged with knew immediately about the catastrophic result of the recent Trident vote, grabbed our tablets and sign-up sheets to proudly voice their concern. Even if they hadn’t heard of CND specifically, the vast majority new and disliked Trident and the government’s proposal to replace it. Once they’d signed our campaign sheets, taken advantage of the free peace tattoos and played around with our placards, many asked us exactly how much the government was spending on the replacement of Trident. Unfortunately, that answer is £205 billion. Two-hundred and five billion pounds. Don’t get me wrong – I don’t think anyone can truly comprehend that amount of money. Even one billion pounds seems pretty intangible to me if I’m honest, let alone 205 of those. This is the figure that CND have estimated that Trident will cost over the course of its lifetime. This is a worryingly huge amount, given in current economic climate of austerity in Great Britain. Imagine the amazing and incredible resources that university’s and schools could acquire if we pumped this money into them. Imagine how our NHS would look with the heightened care the public would receive from well-paid and well-rested staff with good resources. Imagine how the money would ease the housing crisis that we are currently facing in the UK exponentially. The possibilities are endless if you consider where else the Trident pay-cheque could be spent, to create a more direct and positive impact on our lives. Particularly amongst students, there was a strong feeling of resentment towards the Tory government for the increased cuts towards university bursaries and the increased student fees to the ridiculous £9,000 a year. Specifically at LMU, who are renowned for having a particularly green and clean university campus, the #ClimateNotTrident was also a prevalent campaign many wished to pursue. Having spent several hours talking about and discussing Trident with students at LMU, and having spoken to students all across the UK previously, we are certain that young adults and students have a strong opinion on the replacement of Trident. 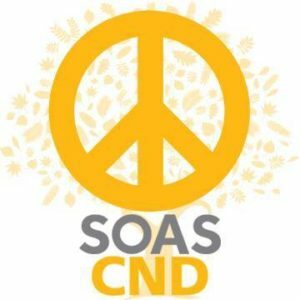 In extension, many of the youth would not consider nuclear weapons to be a significant security threat looking forward. These are the groups of people for whom the Cold War is within history books and not on the television, they have grown up with global terrorism being the prevalent threat instead of nuclear war. Student and youth engagement generally in politics is on the rise, especially in the wake of Brexit, Labour Coups and an increase of MP resignations in 2016 alone. Whatever you may personally think of the Milibaes and the Corbynista’s, they are emerging groups of dedicated and passionate young adults who are engaging with politics in a new, humorous and exciting way. We urge you, regardless of your political leniency, to sign the petition that over 200 students signed last week at the LMU Freshers Fair. If you are thinking of having an event or a stall, and would like to have sign up sheets to collect e-mails and signatures, feel free to download our PDF and JPEG version – and don’t forget to let us know how you get on!